The world we live in today is filled with constant threats of attacks which have in turn led to a tremendous increase in installation of security cameras to improve the level of safety both in our homes and in public places. 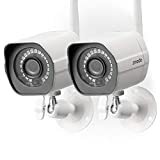 With the development of technology, a variety of cameras have been invented with the most commonly used being security cameras and surveillance cameras. Interested in monitored home security or the best home security camera? Get a free quote from Protect America. Security cameras also known as CCTV cameras, are used to convey signals from one particular place to a definite monitor situated at a distance place, whereas surveillance cameras also known as automatic number plate recognition system, normally work on IP networks which link the camera from the remote area to the assigned security location. Security cameras are thought to be among the wonders of modern technology and have gained great significance in various sectors because of their benefits. So, what are the pros and cons of security cameras and surveillance cameras? The best home surveillance cameras are believed to be an effective security measure due to the benefits they offer. They are also very effective when you need to protect your home. Here are some pros and cons of the best home surveillance cameras. Hinder crime – This is the most significant benefit of security cameras. Whether the cameras are placed discretely at home or workplace, the sight is usually scary to anyone with ill motives since they will know that their illegal activity has been captured. This is a great solution to problems related to crimes and keeps your office or home from being an easy target. Observing scenarios and activities – Security cameras can be placed anywhere as long as there is power source nearby; and depending on your needs, you can install either mountable or hidden cameras to help monitor the activities of people visiting your home or office. This is an excellent way to detect and keep track on dubious visitors. Pick up and assemble evidence – Strategically installed cameras are very effective in monitoring words and actions of people in various occurrences and with the improvement of technology; modern cameras are equipped with high-quality audio and video ability for recording and documenting events. Costs – As compared to dummy cameras, real cameras are costly to install and maintain depending on the features, the number of cameras and monitoring systems. Vulnerability – Advancement in technology has led criminals and other intruders to be more updated and tech-savvy which enable them to identify real or dummy cameras and work out ways to disable or disconnect the power source of the cameras. This makes the use of security cameras to be useless and thus cannot prevent theft. Privacy compromise – Security cameras have created controversies especially in the professional sectors and most employees site its use as an invasion of privacy and also imply that the employer does not trust them. Improve public safety – Surveillance cameras put in public places like a crossroad, malls and parking lots provide excellent surveillance solutions both in preventing and deterring crimes. Reduce crime rates in public areas – It is less likely for an individual to commit a crime when they know there is a surveillance camera at a certain place for fear of being caught. Moreover, in case of any suspicion of a crime occurrence at a given place, the area can be cleared as a precaution. Convenient monitoring from anywhere – Surveillance cameras are very efficient since you can easily access the camera feed on the internet or even on your smartphone. Nevertheless, it also has a few disadvantages just like any other inventions. Costly to install – This is a significant drawback of surveillance camera use since you will require purchasing the system accessories differently and repairs to these systems are also very expensive. Easy abuse of surveillance systems – Surveillance cameras placed in public places can be easily abused and misused for blackmailing an individual from the information collected making its effectiveness to be doubted.